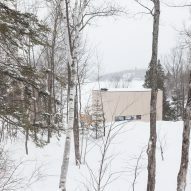 The area is known for its many lakes that serve as an escape destination for city dwellers from Montreal. 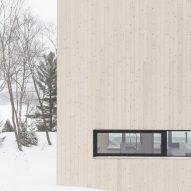 The home's simple wooden volume consists of a square plan, from which a central courtyard was carved out. 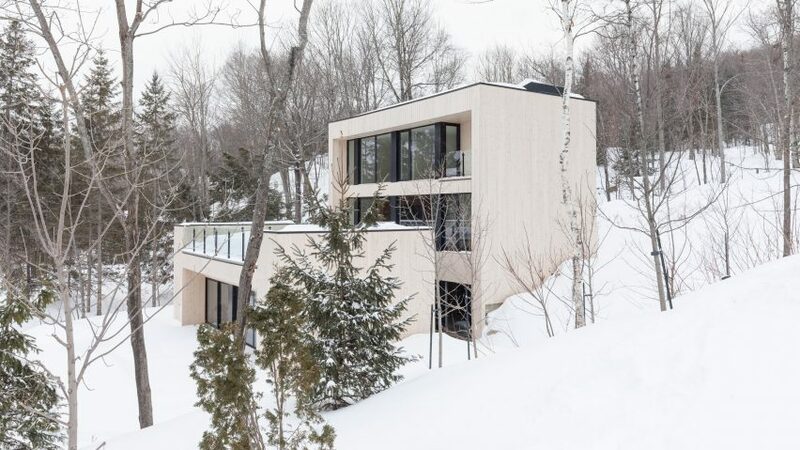 "The square is split in two halves to create an opening to access the residence, like an oyster's shell," said Atelier Pierre Thibault, based in Quebec City. The ground floor encompasses public areas as well as guest bedrooms, which feature bunk beds shaped "like the hull of a ship". On this floor, glass walls illuminate the space and give residents access to the courtyard, which has a tree planted in its centre. An open-tread staircase leads to the main storey of the home, which contains a double-height living room that connects to the open-plan kitchen and dining room. This area opens out onto the rooftop of the secondary volume, offering the inhabitants a generous outdoor space to enjoy in the summer months. 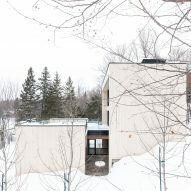 The terrace faces south, and receives plenty of natural light. "The outdoor space is so close to the water, that visitors have the impression of being on a wharf," said the architects. Another flight of stairs leads up to the master suite, which occupies the top floor. 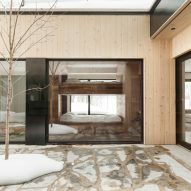 The architects treated this space as an isolated refuge for the owners, who can peer into the double-height living room from above. White surfaces characterise the interior of the home. 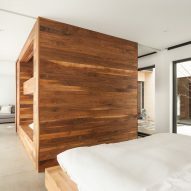 These contrast sleeping areas, which were finished in American walnut wood. 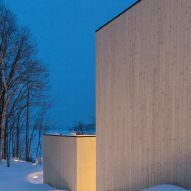 The whitewashed exterior blends in to the area's snowy landscape during the winter.